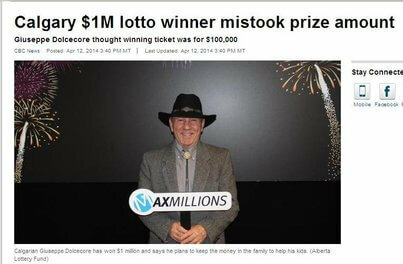 Another man from Calgary posted a significant Lotto Max win. Giuseppe Dolcecore discovered his big fortune when he checked his ticket at the Kaz Lotteries in Signal Hill where he bought it earlier. He was happy enough thinking he had won $100,000, but the store clerk corrected him on the amount – it was for a full million dollars. Makes you wonder why big winners often misread their winnings low – maybe they never thought they would win anything significant. When he came to terms with being a million dollars richer, it was his wife’s turn to need a lot of convincing. Dolcecore says he plans to use the winnings to help his children with his windfall. He was about to buy tickets for the coming draw when he learned he was a big winner. There is no word whether he will keep playing after this win.